I did not realize while growing up, but my mom was a magician in the kitchen. Every single day before sending me and my sister off to school by 8 AM and our Dad to work around the same time, she would have made breakfast and lunch to pack. And breakfast did not mean cereal or something out of a box. It was food made the old fashioned way. Made fresh from scratch with absolutely no processed ingredients. It was not a conscious effort to avoid processed foods, but that was how our lifestyle was back then. My mom would make a 3 course meal (lunch) that we would sometimes eat in the place of a breakfast and grab breakfast in our lunch boxes, as it was more manageable to eat on the go. Unknowingly, we followed heavy breakfast, light lunch rule! Me, being immune to behind-the-scenes chaos, and being a picky (ahem, discerning) eater, would fuss that I did not like anything she made on that day to be boxed for lunch. Sometimes it was truly true. There were some vegetables I hated, some breakfasts I did not like. Sometimes I would just down it without fussing and sometimes I would not. My Mom would insist that I should eat them, and sometimes would not. When she would not, she either had extra few minutes or was sorry to see my fuss. 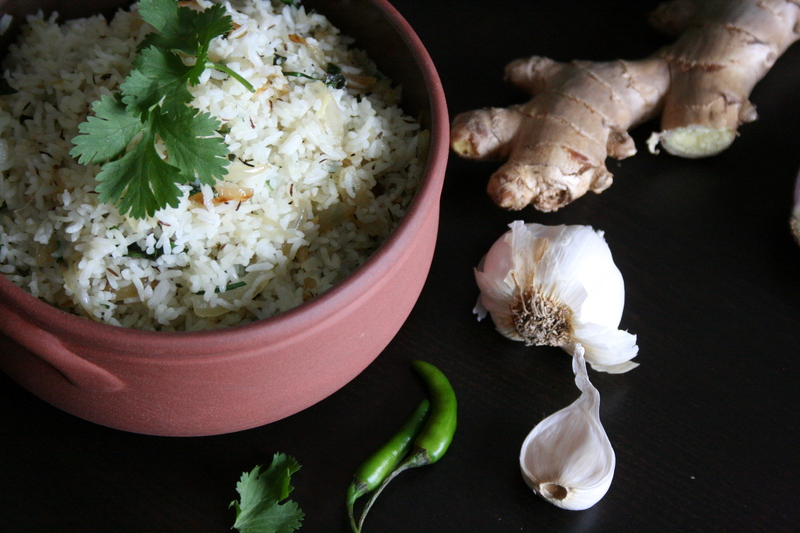 She would whip up this simple rice with Ginger, Garlic and Cumin seeds, which I would eat for breakfast and happily also pack the same for lunch. It is so flavorful that it did not need any sides or embellishments. I could eat that alone f.o.r.e.v.e.r. I would even be looking forward to eat any leftovers as after school snack…..and also for dinner if Mom allowed! 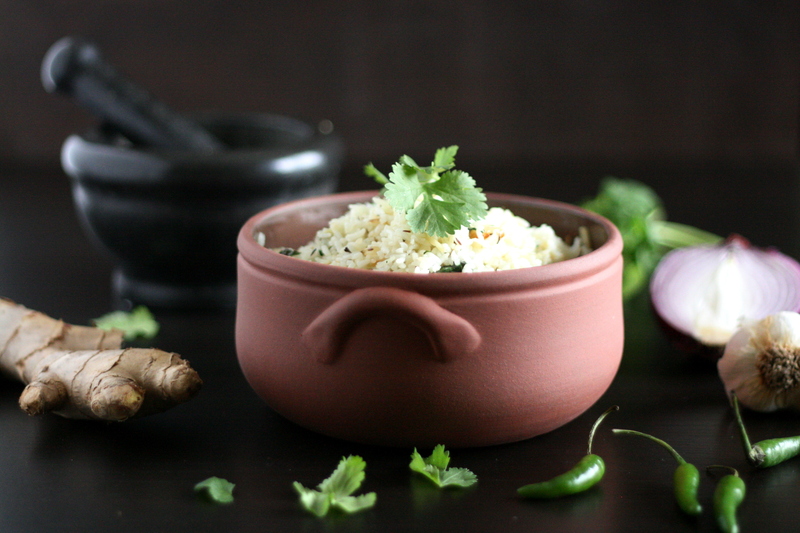 If you already have cooked rice, this can be whipped up in 5 minutes. Mark my words!! * Any type of cooked rice (white or brown) will do. If you want to make it fancier, use cooked Basmati rice. ** Shah Jeera (literally means ‘King of Cumin’) is finer, darker and daintier looking than regular Cumin. It also has a subtler taste than regular Cumin. Heat a wide bottom pan with oil on medium-high heat and add Shah Jeera (or Cumin) and let them splutter, about few seconds. Garnish with Cilantro and serve. There, under 5 minutes! This entry was posted in Recipes, Vegetarian and tagged Quick, Simple, Vegan, Vegetarian. Bookmark the permalink. Nice! I have always had Jeera rice or then burnt garlic rice it never this. I cannot wait to try it. Thanks, let me know how it turns out. 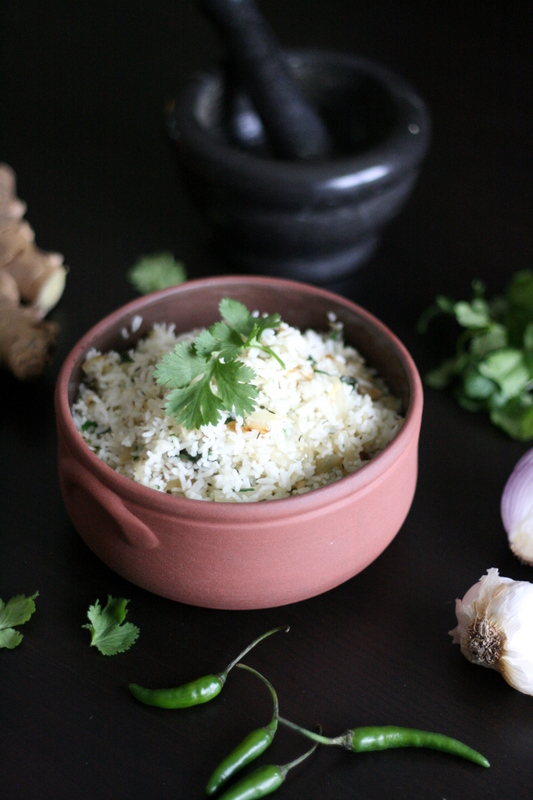 BTW, burnt garlic rice…that sounds lovely. Anything with garlic, and I am in. I totally have to try this or something similar! Sounds delicious! I second the sentiment, this sounds like heaven!! !